You know what I hate at holiday parties? Oversized hors d’oeuvres that require plates, utensils, and multiple bites. Even desserts that require slicing or portioning becomes a pain. They often get messy and gross-looking after awhile. 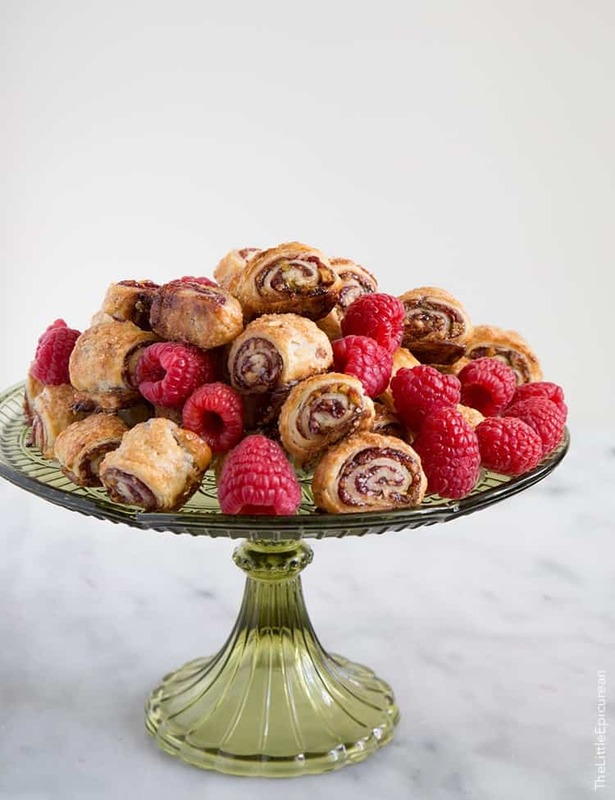 That is why you need these cute little raspberry rugelach at your next party. With these dainty bite sized treats, you can easily help yourself and pop them in your mouth as you please. Since you don’t need a plate, the only evidence of your snacking will be the giant smile on your face. My friends at Driscoll’s recently paired up with Dorie Greenspan in honor of her new cookbook, Baking Chez Moi. They reached out to me to join in the festivities and put on my own spin on Dorie’s delicious rugelach recipe. I gladly obliged since I love raspberries and I’m a big fan of Dorie’s earlier work, Baking: From My Home to Yours. And no need to explain my fondness for rugelach- that’s already documented in my chocolate hazelnut rugelach. Instead of filling my rugelach with chocolate and dried fruits, I wanted something different. Chocolate becomes a staple in my diet during the holidays. I need as much fruit as I can get. You know what has a lot of fruit? JAM! (That counts, right?) I used Driscoll’s fresh raspberries to make a super simple raspberry jam. It’s obvious that raspberries and pistachios are best friends. Raspberries are a touch sweet with just the right amount of tang. Pistachios are savory, rich, and crunchy. Put them together and you get a bright and addicting flavor. And when you sprinkle in holiday cinnamon sugar, you are just asking for a party. Not only are there endless ways to fill rugelach, there are just as many ways and techniques to make them. I love that I am always learning new things in the kitchen. 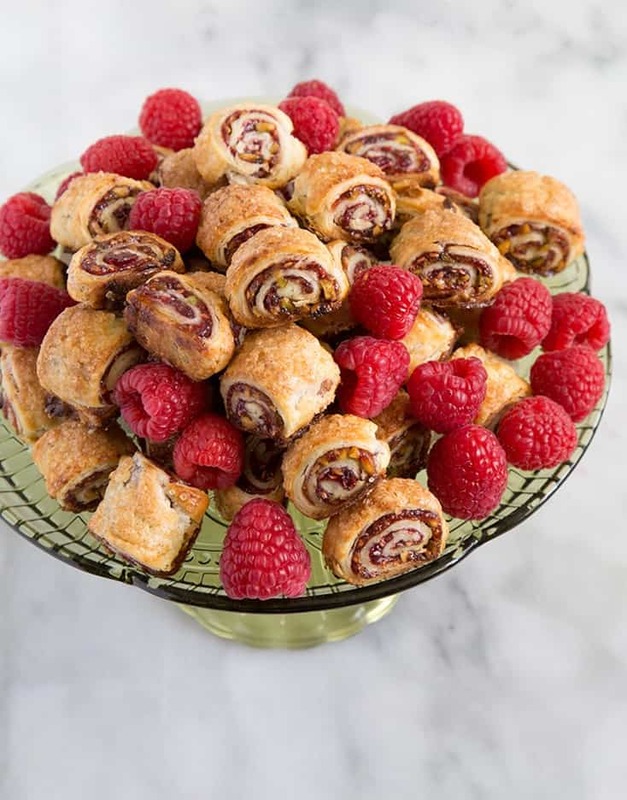 Instead of forming the rugelach individually, Dorie suggests rolling a large log and slicing them into bite sized pieces. A genius idea! I love the cross-section of these raspberry rugelach. The raspberry swirl is SO pretty and mesmerizing. The alluring visual hooks you to keep eating more and more! Be the most popular baker among your group of friends and family by bringing a batch of these babies to your next get together. Trust me, you’ll be loved. Rugelach is part pastry and part cookie. This slice-and-bake method makes rugelach production a breeze. 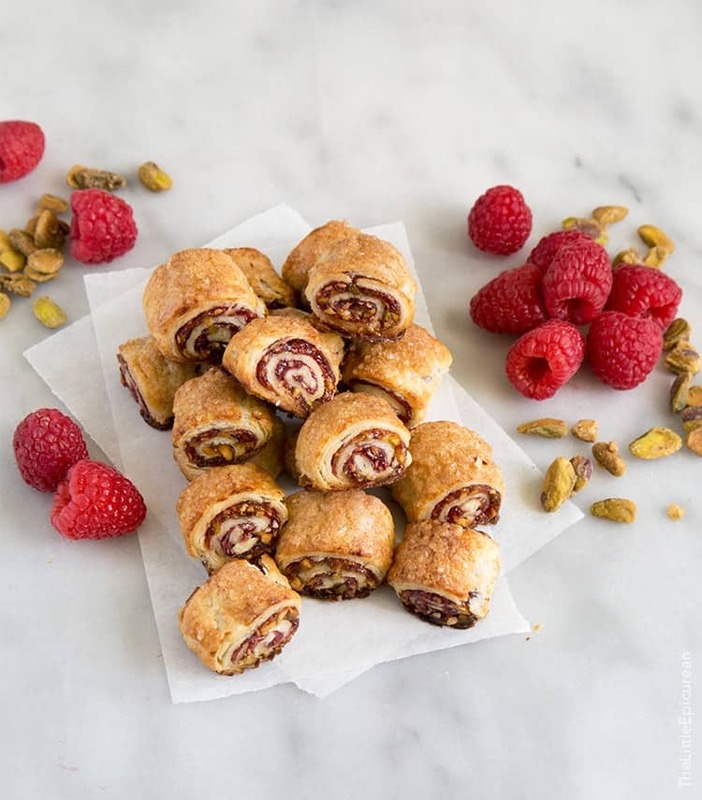 The combination of raspberry jam swirl and crunchy pistachios makes these rugelach a winner! In the bowl of a food processor, pulse together flour and salt. Add cream cheese and butter. Pulse together until the mixture looks like large curds. Do not overmix and do not allow dough to form a ball. Turn shaggy dough out onto a clean working surface. Knead and push bits of dough together. Divide into two equal parts and flatten to a rectangle. Wrap in plastic wrap and let chill for at least 2 hours (up to 1 day). Mix together granulated sugar and cinnamon. Set aside. In separate bowls, have melted butter, raspberry jam, and toasted pistachios ready. 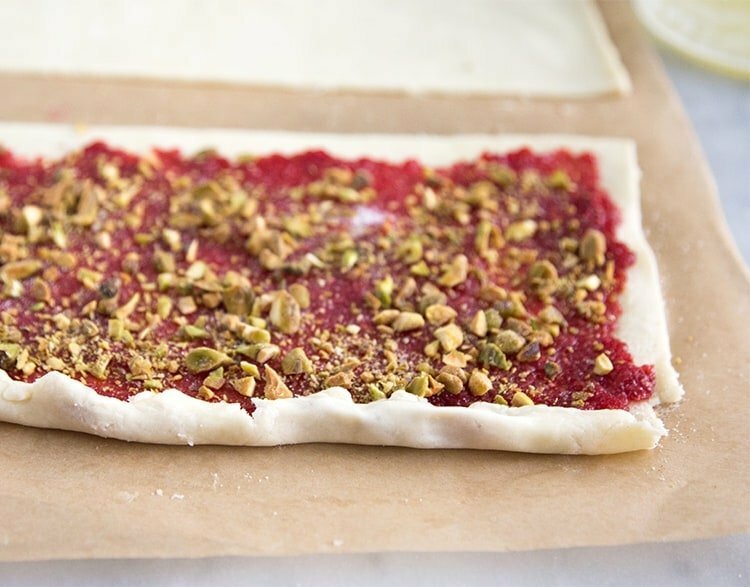 Work with one chilled dough rectangle at a time. Divide dough into two parts. On a lightly floured surface, roll each part into a rectangle about 12 x 6-inches. Brush surface of rectangle with melted butter. Sprinkle with cinnamon sugar mixture. Spread a thin layer of raspberry jam. Sprinkle chopped pistachios and additional cinnamon sugar. Starting at the long end, carefully roll up the dough into a tight log. Place rolls seam side down on baking sheet. Repeat with remaining other half of dough. You should end up with 4 logs. Let logs rest in the freezer for 15 minutes. Meanwhile, beat egg with 1/2 Tbsp of water. Remove logs from the freezer. Brush egg wash over logs. Using a sharp knife (or serrated knife), cut the logs into slices about 1-inch thick. Place slices on parchment lined baking sheet seam side down. Brush additional egg wash over the tops of the slices. Sprinkle turbinado sugar on top. Bake for 15-18 minutes, rotating the sheets halfway through baking. The finished pastries should be golden brown in color. Allow to cool on baking sheet for 3 minutes and then transfer to a wire rack to cool to room temperature. Raspberry Jam: Place raspberries in a medium pot. Mash raspberries and add sugar. Bring mixture to a boil over high heat. Stirring occasionally, cook until mixture registers 240 degrees F on a candy thermometer. This can take anywhere from 10-30 minutes. Remove from heat. If canning, follow directions here. Otherwise, transfer to a clean heat-proof container. Allow to cool to room temperature and store in the fridge until ready to use. Notes: Baked rugelach will keep in an airtight container for 3 days. Unbaked rolls and sliced cookies can be wrapped in plastic wrap and kept frozen for up to 2 months. Simply bake them straight from the freezer when ready. Disclaimer: I was provided with Driscoll’s raspberries and a copy of Baking Chez Moi. All opinions are my own. This is seriously just so gorgeous I can’t even stand it! Stunning and pinned! Oh my, such a pretty and tasty treat. This would be really nice to bring to a friends home. This is one gorgeous treat, Maryanne! Pinning! This looks fantastic – I love the colours and textures! These are so cute! I am totally with you on the necessity of bitesized hors d’oeuvres for parties–I love setting a beautiful table, but there’s nothing worse than turning around a few minutes after the first guests have arrived only to find that the table already looks like a lunch room buffet line…bitesized treats are a must! These look like a perfect addition to a holiday spread! And there are pistachios?! Jeeze. Just divine. I love your presentation with the fresh raspberries and cookies on the cake stand. Just beautiful, and something even I could pull off. :) The recipe sounds fantastic too! Pinning to share. 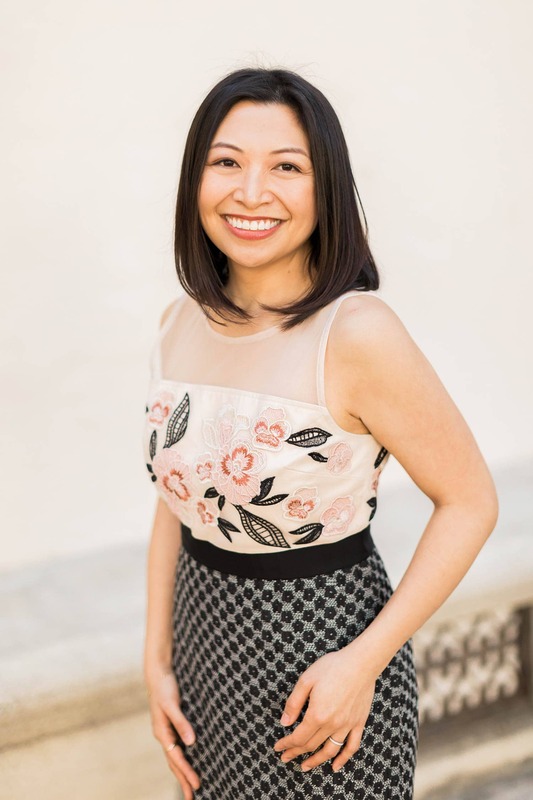 You have all kinds of fun treats on your blog! 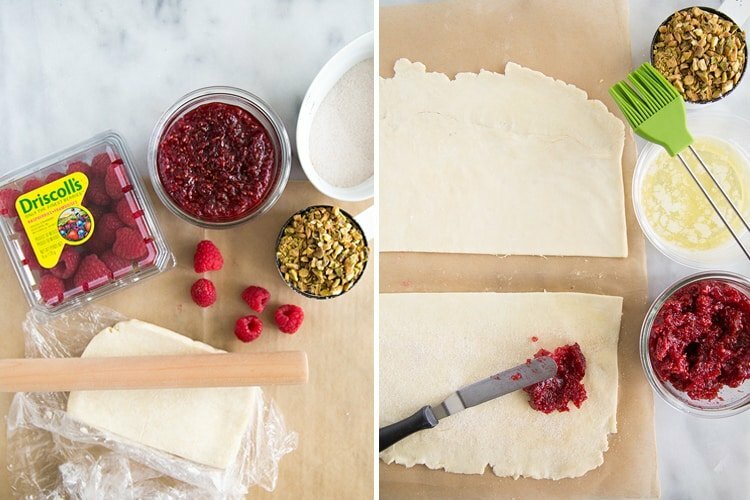 Love rugelach and this raspberry pistachio combo looks so festive. Love the red and green! Can I save time and use a pre made crust or will it not puff as much? What do you mean by pre-made crust? Store-bought? The dough for this is special because it has cream cheese. You can make the dough a day in advance. That sounds wonderful! I must try that flavor combo!